Very happy twins standing in front of the Funnelweb and the Perfect Storm rides. 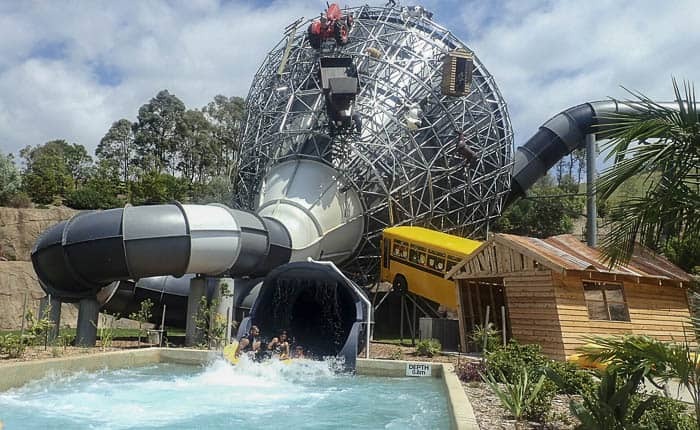 One of our family’s favourite summer days out is to Jamberoo Action Park. 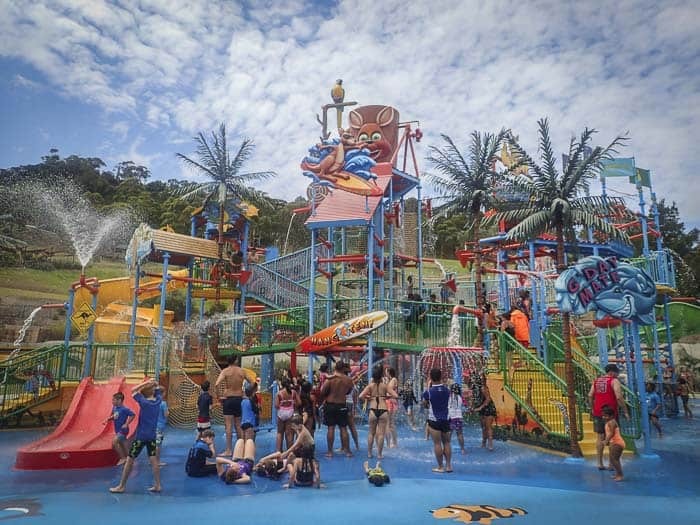 Jamberoo opens for the 2018-2019 season at the start of the school holidays. 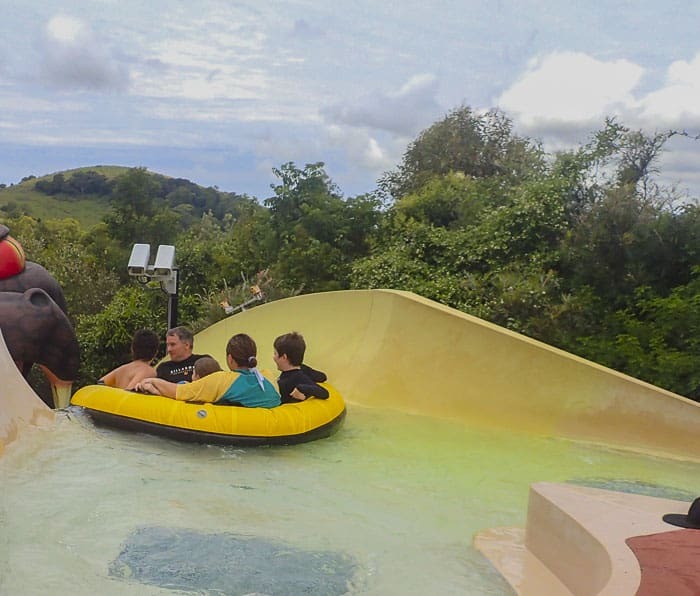 Jamberoo is open each Friday – Sunday until December when it opens daily for the school holidays. 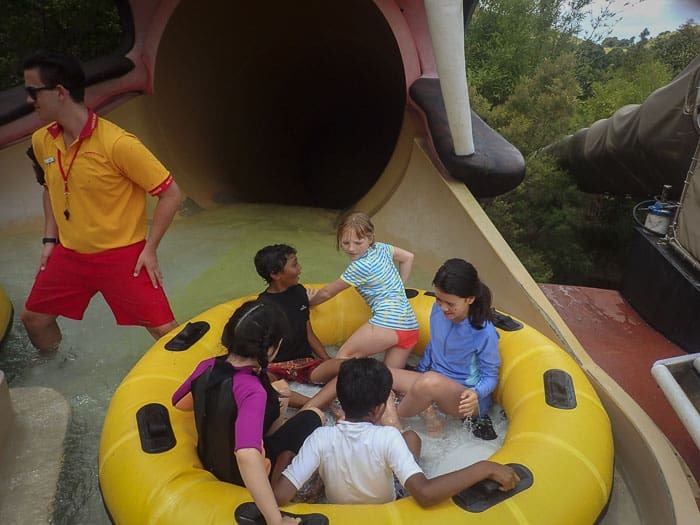 Jamberoo has been an annual Big Day Out for us for many years and this year’s expedition was as joyful and adventurous as ever. We were lucky to have a day at Jamberoo without big crowds so we didn’t have to wait for more than a few minutes for any of the rides. Bloody marvellous! My twins are now 10 and great swimmers so I feel quite relaxed when they run around and do rides on their own. But we all went together to go on the new ride, the Perfect Storm, you can see it above with the tractor and bus attached. This amazing ride has three tornado sections where you swirl around a funnel, and it’s REALLY long. We loved it, even myself who gets quite freaked out in the dark section of water slides. I still find the dreaded Funnelweb scarier though. Check out this mini video. The Taipan is another of our favourites. When the kids were little they always demanded that I went on with them but they are happy to go alone now. I still do it though, just not as many times as them. Billabong Beach, with it’s huge water playgrounds, is where we usually base ourselves. If you get there early you can grab some of the loungers in the shade. Billabong Beach is ideal for younger kids, with lots of splashing and sliding for them to do. The Rapid River is another of our family’s faves. Banjo’s Billabong was new in 2015 and it’s also enormous and a great spot for families to picnic around. 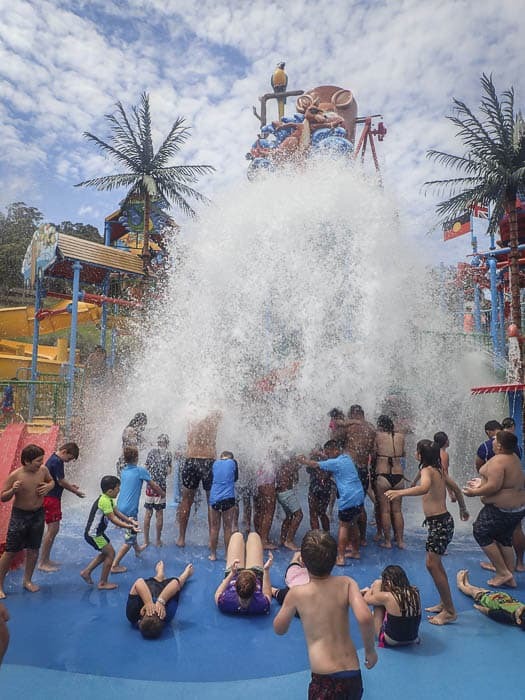 The massive bucket splash is a kids’ favourite but it’s too wild for this old mamma. Check out all the other rides and the fab wave beach on the Jamberoo website here. See a park map here. My kids love the action at Jamberoo. Best of all it appeals to the primary schooler (aged 7) and the teenagers (aged 13 and 15). The taboggans are a huge hit and great for when they want to dry off, Billabong Beach and the rapid river are great for taking it a bit quieter and the teenagers are definitely up for the Funnelweb. This mamma won’t be stopped either – I’m with them on every ride, loving the watery action! My girls would love too win the tickets, they have never been too a water park and it would be an exciting experience for them. I would def join in on slidding as well, theyll have too beat me too the lines ? My little one is a slide demon and would go crazy if given the chance at Jamberoo! This would be an amazing first waterslide experience! We would love to get the free tickets. 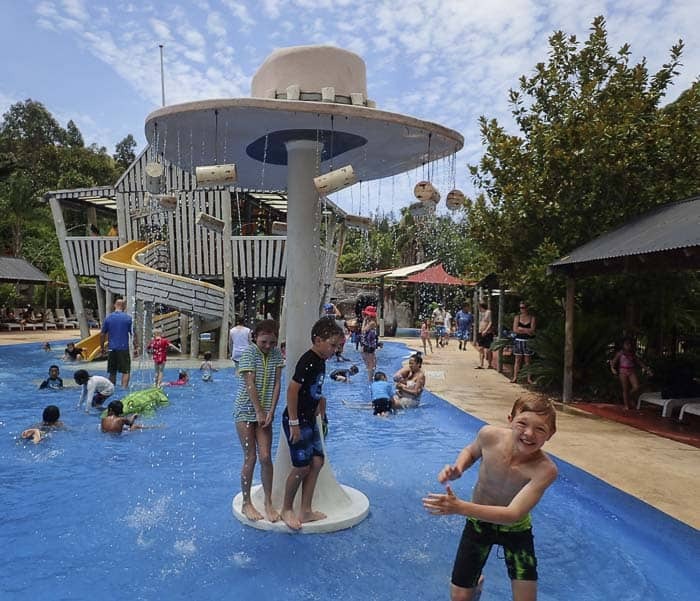 Our family has never been and would love to try everything jamberoo has to offer! I think the funnel web is on top of our list to try! Would love to go as I have never been there before. We would love to win tickets! We are planning to camp at kangaroo valley after Xmas and visit. I haven’t been since a year 7 school excursion in 1991. I’m not sure if I’m brace enough to ride ? 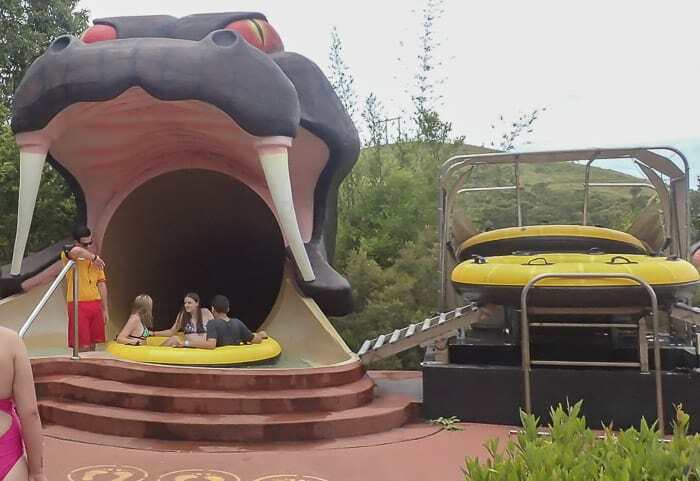 My kids would love to visit Jamberoo. Been once 5years ago and they havent stopped talking about it. Im a chicken so ill hang out at the wave pool! Double the action for my child with a drive to Jamberoo and so much water fun outside of city rush. I would love to slide myself and leave behind the mundane life at Jamberoo. Whoa!.. We are big fan of adventure sports and love to be thrilled. More than my kid in enjoy these rides! I’ll even have a crack at any he wanted to skip! ? My Kids would head straight for the thrill rides and try the new attraction, Perfecr Storm too. 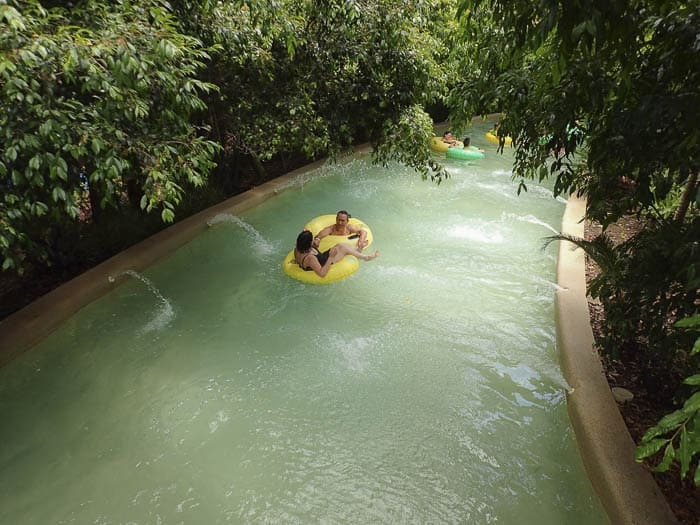 Jamberoo is definitely a destination we’d like to visit. Yes I’m keen in joining in too. Cheers. My kids are absolute thrill seekers and LOVE a good water slide. I never miss out on the fun so my husband and I would absolutely be joining in the fun! My kids would love Jambaroo as they are both little water babies. We haven’t been there before so would love to check it out. I would go on some rides as long as I’m not pregnant at the time!! My little ones would love the kids area of jamberoo. As for me first ride I am on is The Perfect Storm!! We would love to win tickets! We haven’t been to Jamboroo since January 2014 and I’d love to try some of the new rides. My kids even more so. They might be brave enough to join me on the funnel web now they’re older! My son would love going there as he is just getting more confident in the water thanks to lessons and nippers. So he would have a blast and try his new skills! Plus my husband and I couldn’t help ourselves but get in there wight with him too. Sounds just fabulous!!! My 9 year old twins and I would LOVE to go to Jamberoo. I took their older brother a couple of years ago and we loved it but they missed out as they weren’t ready (due to their ASD). They love the water and I would definitely be going on all the slides with them (from necessity and because I’m a big kid at heart). We haven’t been to Jambaroo yet, keep saying we must go! My 10 year old daughter is a real water kid and would love the thrill of the rides! Actually, me too. I’m a big kid at heart! Fun for all ages. Every time we have been we create excellent memories. Also adults have just as much fun as the kids, if not more, and yes I would definitely slide too! Our two boys would love a day out at jamberoo, they have so much energy for those fab water rides! I would love to try the funnel web! ? My kids would love Billabong beach and the giant water bucket. I would definitely slide, I haven’t been to an amusement park since I was a kid. Would love to experience jambaroo with my family. But gee, with 4 kids it sure does cost a sum! If we are lucky enough, everyone will try all the rides, even me the mum! 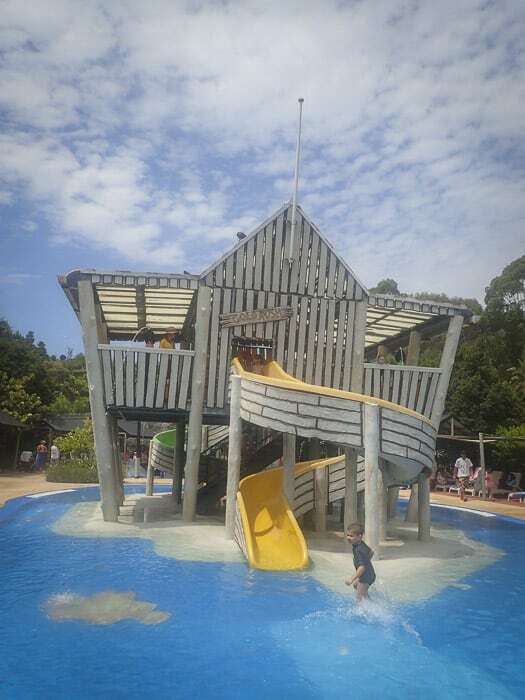 My two boys would be so thrilled to Jamberoo…. 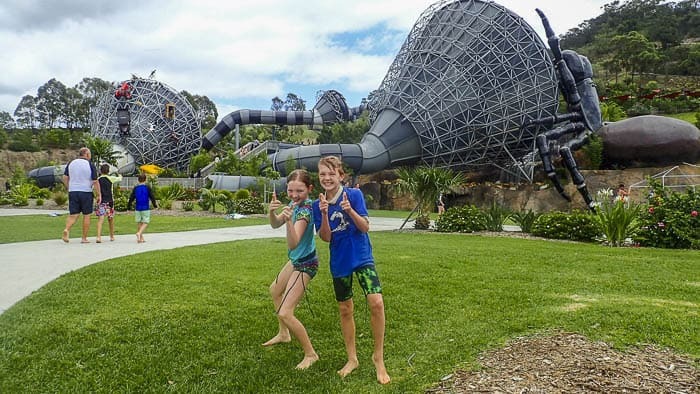 they both love waterslides and have never seen anything like what is on offer at Jamberoo… I would love to see their little faces when I show them the photos. Would I slide? …. of course! I have always wanted to go since I was a kid. My daughter would love Jamberoo as she loves water and a bit of an adrenaline junkie like her parents. We would greatly appreciate the opportunity to get away from the hustle and bustle of the city and unplug from electronics to enjoy the outdoors and fresh air. We would be enjoying all the rides as A family as we are all thrill seekers!